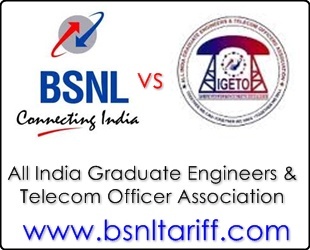 After formation of Bharat Sanchar Nigam Limited (BSNL) in the year 2000, Direct recruited BSNL employees executive association (Union) All India Graduate Engineers, Junior Telecom Officers and Accounts Officer informed to for indefinite strike until their genuine demands were not solved. AIGETOA Union General Secretary announced that we’ve kept six demands related to basic pay, retirement benefits, promotion, discrimination in transfer, discrimination in promotion policies and formal platform for the association, in front of BSNL management and claims that association has around 12,000 members which includes both executives of accounts wing and Engineering wing. In continuation AIGETOA claimed that the strike is likely to impact BSNL’s mobile services and billing services as around 90 percent of protesting employees look after these services. After announcement of AIGETOA call to go for indefinite strike the CMD of BSNL countered that, on all genuine demands of employees will be solved under possible circumstances and discussion and appealed them to withdraw their decision which will harm BSNl and same will adversely affect the striking employees.